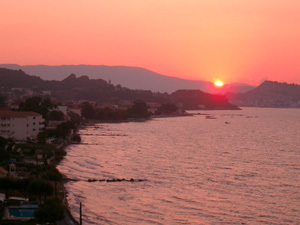 This itinerary begins from the port of Zante, where you have to take the long and beautiful coastal road that, crossing the region of Vassilikos, reaches the charming bay of Gerakas, the southern part of zakynthos island. 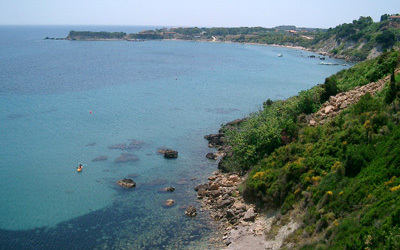 We fast pass the tourist village of Argasi, about which we will speak more after, in order to continue towards south. For those who love breathtaking panoramas we suggest a marvellous place that very few persons know. As you have passed the tourist village of Argasi, the coast road starts to go up and you’ll find on your right a narrow unpaved road. If you follow this road it will take you up to the mountain to reach the small Skopiotissa church, the most ancient in Zante. From here the view is really stunning, you can see all together the bay of Laganas, the far coast of Peloponnese and the island of Kefalonia. After this deviation we go on to discover all the peninsula of Vassilikos that is a continuous of several huge sandy beaches one next to the other. They are perfects to relax under the sun! To reach them follow the many small streets on the left that come down towards the sea. 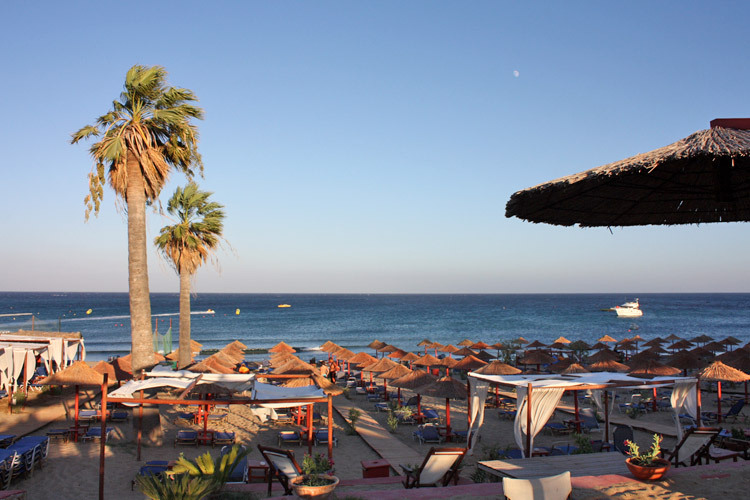 The trip that we like to suggest you includes those that we think to be some of the most beautiful and particular beaches of the island; Daphni and Gerakas. You will reach the first one by taking a small and unpaved road on your right just few kilometers after the village of Argasi; there is a sign that marks it, but pay attention because it is not so big! The beach of Dafni is sandy, bathed from the warmest waters and with an amazing view over Laganas bay and the Marine Park of Zante. After a swim in this splendid beach, we take back the coastal road and we continue our trip towards south, offering you two different possibility... still relax or an amazing enjoying afternoon! If you decide for relax, you must follow the coast road until the marvellous beach of Gerakas, ideal for those who love to lay under the sun. If instead you are interested on an eventful afternoon, you cannot lose the St. Nicholas beach, where the target is mostly young and it’s full of people ready to enjoy themselves. For nature lovers, we signal moreover, along the road that bring back to the city of Zakynthos, the large pine forest, situated near Banana beach. A beautiful place where to relax completely in contact with the Mediterranean nature. For the evening we advise you to move towards Argassi where to have dinner you will not have problem to choose and where you can pass the evening drinking a cocktail or dancing. Have you seen the movie with Leonardo Di Caprio “The Beach”? On Pelouzo island, located in the turtles bay, you won’t find fields of marihuana nor wild tribes but an unspoiled sea populated with turtles and fish droves. 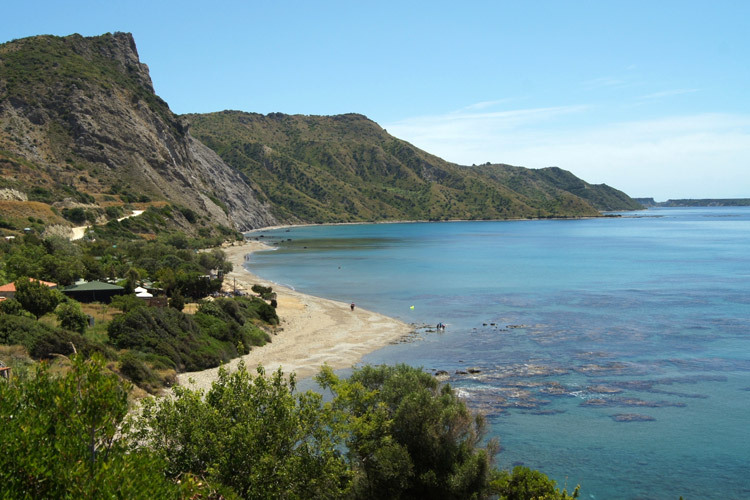 During the Summer period, in the sea around Pelouzo, it is forbidden to navigate but if you have spent Winter in a gym and you now have a Baywatch figure you can try and swim to the beach of Dafni. We suggest taking a dinghy with you for possible moments of “dispirited”, a bottle of water and vitamins integrators since to swim there it will take, if you are swimming with a good rhythm, one hour and half. The island is slightly mountainous with a single beach (in front of Dafni) that looks like talcum powder rather than sand, and there is an ancient building in ruins at the end of the small beach. 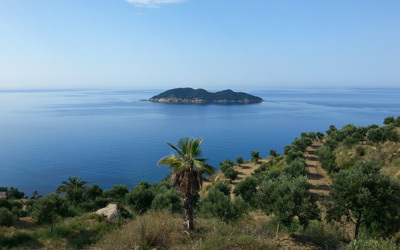 At the opposite side of the island there is a cave of medium dimensions; it is lovely enough but we suggest saving energies for the coming back since the island belongs to the Marine Park and you can not spend the night there.